Enough with this pessimism! What’s with all this whining and complaining? Let us remember the events from a hundred years ago, from Erich Maria Remarque’ novel „All Quiet on the Western Front”, and Jaroslav Hašek’s “The Good Soldier Švejk”, where he described the same atrocities of the First World War. How much depressing pessimism is emanating the first novel, and how much optimism we find in „The Good Soldier Švejk”! Perhaps we should read Švejk again, and then our situation will look more optimistic than after reading, for example, the Constitution. Let’s start with Recep Tayyip Erdoğan’s visit – does anyone remember the sarabande of official visits in 2014, when the Europeans tried, through their visits, to protect Moldovans from the possible aggression of Russia? Of course not! As a result, on the background of Moldova’s international isolation, after the collapse of the pro-European „enthusiasm”, Erdogan’s visit comes as a gift for the current government – “we are being noticed”! It’s true, though, that we, Moldovan citizens, do not know what exactly have Plahotniuc and Erdogan discussed and agreed upon on September 27, 2017 in Ankara, because you have to be a complete idiot to believe what the “holding” said about that meeting. But why should Plahotniuc report to us, the citizens of the Republic of Moldova, about those discussions in Ankara, if his holding, alongside all the „pro-European” parrots in Parliament and beyond, silently silenced, when Plahotniuc, who was just a deputy then, met President of Kyrgyzstan Almazbek Atambayev on March 15, 2015, at Plahotniuc’s hotel „Nobil”, the official arriving in Chisinau by Ilan Şor’s plane, before going to St. Petersburg to meet with Putin? And although Irina Vlah has several times announced Erdogan’s visit, things were still in suspense. It is obvious that, this time, the „pro-Europeans” in Chisinau have found arguments to convince Erdogan – by packing the seven Turkish citizens, as appropriate in Europe, and sending them as a „tribute” to see him in Moldova. Frankly speaking, I did not understand why Erdogan made this visit. Turkish citizens, even without a visit from their ruler, were coming to Moldova, staying at the „National” Hotel, looking for over-confessional bodily pleasures. Turkey is a country with a population of about 80 million. Only about 18 million live in Istanbul, of which about 3 million are Kurds. However, I did not notice any intention on the part of Erdogan to apply the same honor to Gagauzia, create some autonomy there! It’ true, though, that thanks to Erdogan’s visit, I heard Dodon speaking some Romanian at Comrat – „noblesse oblige”! Otherwise, those trivial phrases did not stop Dodon, the creature of Plahotniuc, to act as Irina Vlah’s lace before Erdogan. And I do not see any contradiction in the fact that MAI (ministry of internal affairs) denies receiving the „TOMA” vehicles. Dear journalists, have you tried to look for the vehicles at Argus-S? It may be so, that the defense of the “European path” was not assigned to some simple men at the MAI! Speaking of journalists – I do not understand why so many condemn the lack of freedom of speech etc. None of them got treated at the PDM the way headquarters in the same way as the poor journalist Jamal Khashoggi, who disappeared after entering the consulate of Saudi Arabia in Istanbul on October 2! 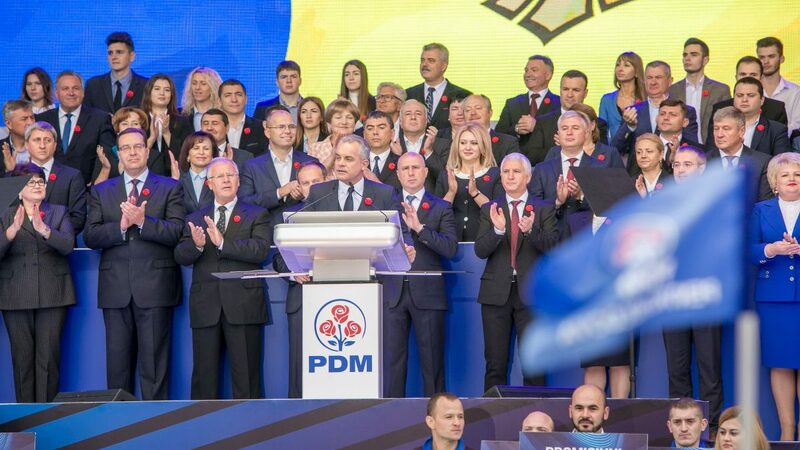 Yes, it has happened that the representatives of the „Fourth Power” stand as fools at the PDM headquarters, and the promised press briefing, where they ought to the announce their great plans for the Moldova, was canceled. But everyone was calm, no journalist was dismembered with the chainsaw at the PDM headquarters. Some of them are probably even paid for being there! Therefore, we do have reasons to be optimistic! Smile! Do you imagine, my dear readers, with how much humor would Jaroslav Hašek describe the eagerly expected and long awaited by Dodon visit of Kirill Gundeaev – the “ Blessed Patriarch of Moscow and All Russia” in Moldova? This Kiril will be welcomed by the „Knights of Orthodoxy” – Dodon and Co.
No, these „knights” will not be extradited to Putin as Russian agents, as the poor Turkish teachers were. They only work, together with Kiril, to mobilize their electoral herd in the run for the February 24 elections – the story with the „30 000 Syrians” has gotten old. Something more „fresh” is required! Perhaps this time the herd will get scared with the „coming of the Antichrist”. Soon, all the icons in the Moldovan churches will be decorated with St. George’s ribbon. And the Metropolitan Church of Moldova will publish a new series of icons, in which Dodon – the „knight of Christianity” – will be represented holding a „Kalashnikov”, a universal tool for promoting „Christian love”, Putin style. I do not think that in Comrat, on the occasion of the long awaited arrival of Kiril, the monument of Lenin will be demolished, the man who ordered the mass extermination of priests and the destruction of the churches. But, without a doubt, the idea of ​​the „Gagauz Diocese” will be reanimated as the cornerstone of the future subject of the Federation, under Kozak’s wand – in Moldova, you can be everything, but Moldovan (please do not accuse me of incitement to interethnic hatred)! And yet! If Soldier Švejk would have commented on this spiritual visit unmistakably, he would have drawn attention to the fact that even the Russian rockets „Soyuz”, being sanctified by the priests in the Russian Orthodox Church, sometimes collapse – the last one collapsed on October 11, 2018. It’s good that that the poor astronauts have escaped alive! In our case, it remains to be seen what will happen to the „Plahotniuc-Dodon binomial” on February 24, 2019; blessed (or not that much) by Kiril, will they reach the „orbit” of power, or ..? Regrettably, Ilan Shor will have to make it on his own, without Kiril’s blessing. Instead, Shor will give it a try with his Central TV channel, explaining to the Moldovans how happy they will be after he, working side by side with the „binomial”, will restore the kolkhozes in Moldova! I will now stop with the unrealistic approaches of sacred things! I do not want to be accused of sacrilegious, commenting on „PDM National Assembly – For Moldova”! I categorically reject any speculations about the millions of lei spent to transport the people to the Great National Assembly Square – the CEC (Central Electoral Commission) will not be able to track them anyway. I categorically reject any speculations that state workers were threatened to sign the commitment that their bodies (still alive) be transported to Chisinau. I cannot imagine that the teachers, who have to educate the future citizens of the Republic of Moldova, behave according to the principle “fear is shameful, but it’s healthy”! 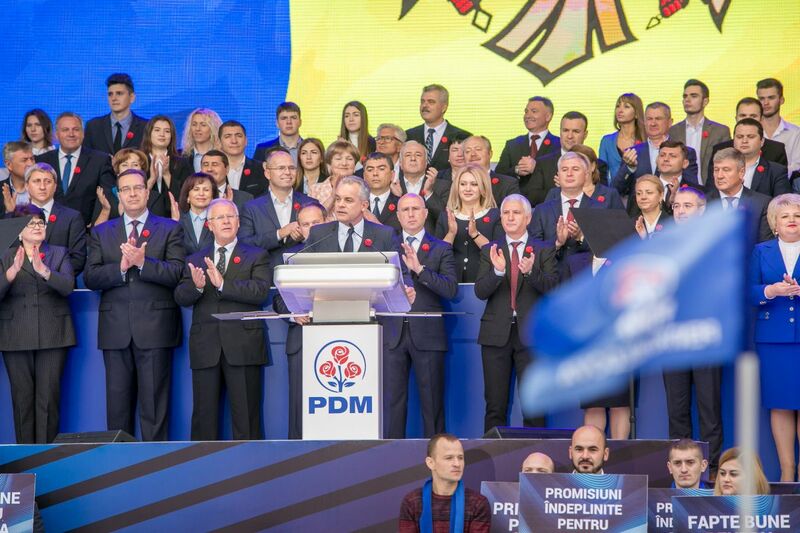 At the staged PDM rally, I saw everything – just as in the description of the house of fools in Jaroslav Hašek’s novel – plus a little political pedophilia, namely the exploitation of children in political purposes, and a little of the personality cult – but not as in the Ceausescu times! It was somehow moderate, more in the European style! We found out that the critic of the mafia clan that now holds the power is equaled to blackening the statehood and that we, bastards, without understanding this, are already happy thanks to PDM! We have heard about the authentic sovereignty of the bandits, who simply want to have the freedom to keep stealing from the docile heard. I understood that we, Moldovans, have our own Messiah – the man that knows to love his country – as long as he is able to steal money from this docile heard and to hide them in offshores. On the 12 500 square meters of the General National Assembly Square, if we trust Iura Nichiforciuc, was enough space for 100 000 PDM supporters. We shall see if, on February 24, 2019, this show will have the expected impact, given the immense hypocrisy that we have seen. Finally, thinking about the multiple identities-citizenships of the “Messiah”, I have reckoned the Russian and Romanian versions of the anecdote about the difference of practical and theoretical sides. Therefore, practically, what we have is a destroyed state and a mafia whose hostages are we. It’s a pity I gave up on the Chisinau municipal counselor mandate – I would have come, even if without a chance, with the initiative of renaming the General National Assembly Square into the General National Prostitution Square – more laconic and more honest. Initially, Hašek met to write the story of Švejk in 6 volumes. The volume „The Glorious Disaster” remained unfinished, for Hašek died of a heart attack, on January 3, 1923. The glorious disaster, in Moldova’s case, with its fourth way, is being written by us all – those who have not yet died/run and still bear the title of citizens of the Republic of Moldova. Plahotniuc-Messiah said he felt the fantastic energy of the people that were brought by him to the Square as one brings animals to slaughterhouse. But is Messiah sure that this “fantastic energy” will transform into votes for PDM on February 24? We still have to understand which of us are “animals” and which are “citizens of the Republic of Moldova”. One thing is sure: Tepes-Voda, from Eminescu’s “Third Letter” would be confused, trying to divide us into fools and cowards. Therefore, it is our duty to figure it out.